Whether we deny it or affirm it, America is under God’s jurisdiction. We are his property, so to speak. This argument can be strongly supported by three indisputable facts. King James I commissioned the Virginia Charter in 1607. It stated that the second purpose of the Virginia Colonies (all property in the New World England was laying claim to) was to bring the message of Christ to the natives of the land. (www.lonang.com/exlibris/organic/1606-fcv.htm). This document and mission constituted the legal claim that America was established as a nation under God’s authority. The second reason America is subject to God is because of the actions of the colonists who drew up the Mayflower Compact, which is unquestionably accepted by historians as this nation’s first governmental document. The Mayflower Compact basically says that the colonizing of the Virginia colony (America) was to give fame to God and advance Christianity, and that the new government was created to serve those purposes as well as to insure a civil society. The people, acting in concert with solemn purpose, had the civil authority to establish a contract with God for the new nation, and that is precisely what they did. The third reason America belongs to God is because of what transpired on the coast of Virginia on April 29, 1607. Robert Hunt, chaplain of the Jamestown settlers, planted a cross in the sand at Cape Henry beach. In so doing, he signaled that the church was using her spiritual authority to dedicate the new land to God. (Guide to Military Institutions. Craig, Dan. Mechanicsburg, PA Stackpole Books, p.248, 1977) http://www.nps.gov/jame/historyculture/the-reverent-robert-hunt-the-first-chaplain-at-jamestown.htm). The colonists essentially gave God the spiritual authority to do as he pleased with the new nation. In conclusion, God has a legal, civil, and spiritual claim to America. He did not take that authority by power alone, or by innate right. It was given to him deliberately, definitively, and irrevocably by the people. There is a spiritual principle at work here. Anything that is dedicated to God must be given completely for God’s purposes. The reason this message is so urgent to us now is because of the unattractive alternative: if something is dedicated and misused, then it must be destroyed. This, my friend, is why God has blessed America for over four centuries. Dare we fail him now? 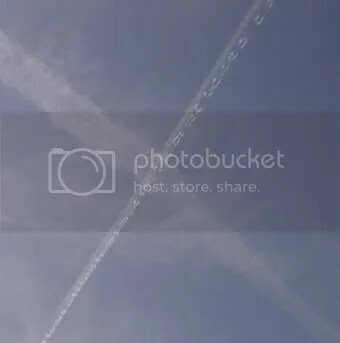 Last year, 2009, I went outside on Memorial Day and was enraptured to look up and see that jets from the nearby Air Force base had flown perpendicular to each other, released trails of smoke, and formed a cross across the sky from horizon to horizon. Honor the fallen. This year, 2010, I looked up to see a perfect blue sky. There was no cross. What happened? I’d like to find out. Were the pilots under orders to be neutral in matters of religion? Like they were told at last year’s God and Country celebration: Don’t do a fly-over for a sectarian event. Since when did God and Patriotism become sectarian. It is simply one other sign of the forced government secularization of society.